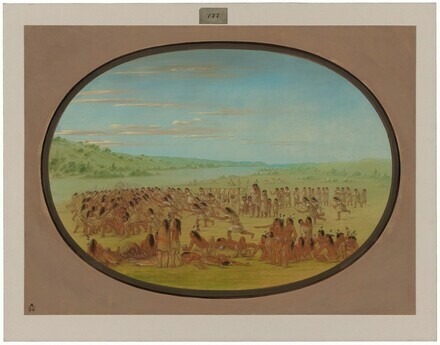 BALL-PLAY OF THE WOMEN (Sioux).—The author witnessed this exciting strife at Prairie du Chien, in 1834, when the Sioux had assembled to receive their annuity from the government. The chiefs, after having received their annuities and annual presents, arranged a great quantity of calicoes, ribbons, and other presents on a frame erected for the purpose, and for which the women, divided into two parties, played, to the great amusement of the men, who were enjoying their bottles of whiskey. Indiens des deux Ameriques, Salle du Jardin Botanique, Brussels, 1870, no. 178. Catlin's Indian Cartoons, Somerville Gallery, New York, 1871, no. 177. Extended loan for use by Ambassador Nyborg, U.S. Embassy residence, Helsinki, Finland, 1981-1985.